Don't you just love shopping at the Farmers' Market? Fresh veggies, homemade goodies, people talking to neighbors and others in their community--all make a Farmers' Market a special place and experience. 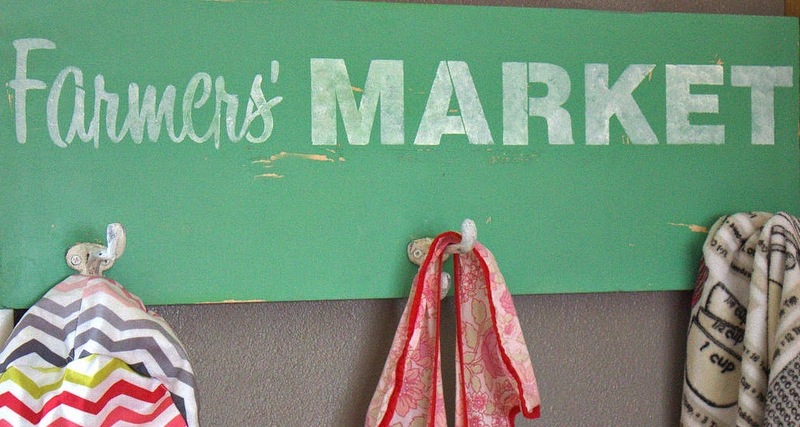 I have sold my furniture at our local market for 14 years now, and while the market here in Southwest Montana won't get going until June, I am getting in the "Market Mood" with this vintage inspired sign and coat hook. This is a very quick project, thanks to the fabulous stencil from Donna at Funky Junk Interiors. After designing signs for years, Donna is making it easy for the rest of us with a line of stencils. These stencils are HIGH QUALITY, reusable stencils that I know will last for years. They are reminiscent of old time signs with fabulous fonts and endless possibilities. I started with a board I had, this was from a cabinet I think. I painted it with Fusion Mineral Paint in the Ceramic color. 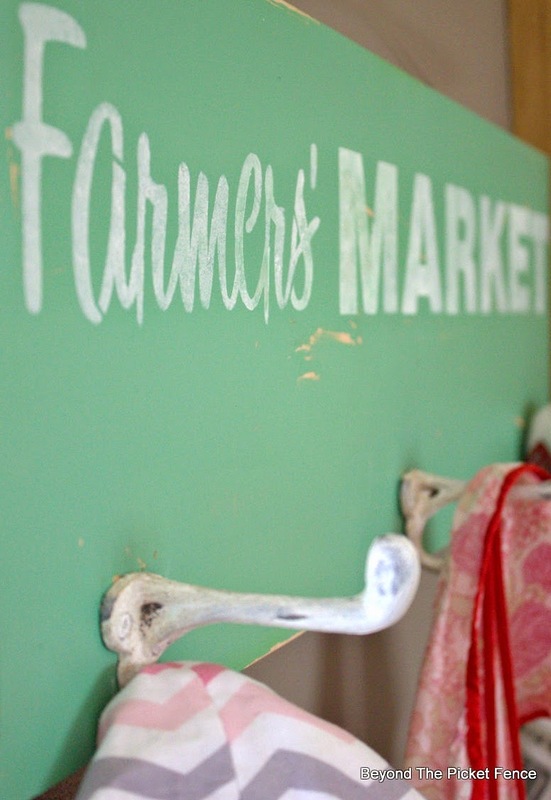 I then stenciled the Farmers' Market in white, distressed it a little, and added white hooks. I love it in the kitchen for aprons, a cooking cap (made by my daughter for home ec. ), and towels, but it would be equally as cute in an entry for bags and coats. Besides sharing another stencil project tomorrow in my project challenge, you are invited to participate in our Project Challenge by linking up something that fits this month's challenge--LEATHER OR LINEN fabric. So , get busy on a fun project using one of these materials and come back tomorrow! Linking up at Funky Junk Interiors. Oh Becky... how adorable this this?! LOVE the colours you chose with this design! 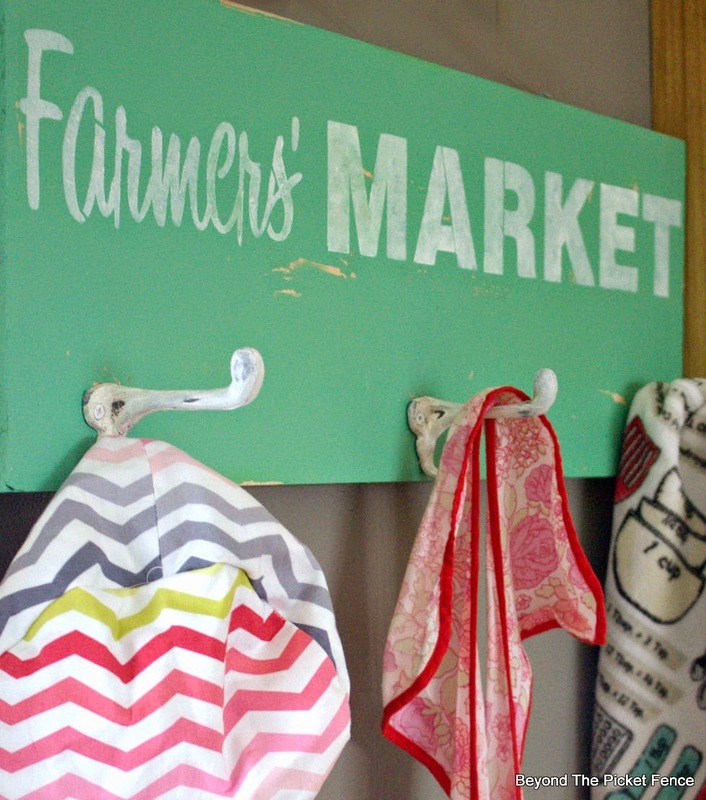 And the painted hooks were an awesome vintage touch! Thanks so much for trying the stencils out! So glad you liked them! I love this green color and that stencil is fabulous! The stencil worked perfectly for your rack...looks wonderful!